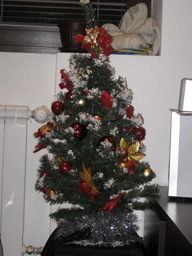 Life in BG » Oh Christmas Tree! Well….we are here…in our flat, with our hound. When I am a little less bitter, I will tell you the traveling nightmare we had getting here, then the scary visa problems. But for now, let’s focus on something a little more positive, shall we? It is definitely Christmas here in Bulgaria! When we came home, we saw that the guy who stayed in our apartment and took care of our dog (I must tell you how the hound now rejects us for another!) 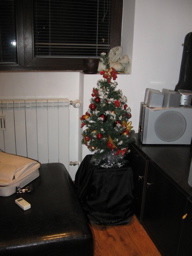 set up a little tree in our flat so we would feel Christmas-y when we got here. Isn’t that so so so nice? Tomorrow, my mission is to find popcorn and other things I can string to make a few more bio-degradeable Christmas decorations for the flat. And on Friday, Mark’s office is having a quite the party, with catering and awards and everything. All the employees voted on each other’s websites and the winners in seven different categories are getting prizes. We are really looking forward to this weekend, as I’m sure are all of you!!! p.s. Sorry if our gift to people in the U.S. are late–things got a little hectic the last few days and I’m not sure if I made all the shipping deadlines. Anyways, technically, Christmas lasts 12 days, you know, like the song??? So I just plan on using all 12 days. Double p.s. Since you can’t be here (I know you’re SO jealous), I will be sure to fully document how the holidays are passed in a different country for you. Already I can tell you there is a lot of shopping here, but not nearly as much as at home–there is no frenzy. Expect lots of pictures over the next few days, as the city is decorated and we are expecting snow. MY FIRST SNOWY CHRISTMAS!! What a niiiice thing to do…give you a tree! Sorry to hear you’re sick, Kristy; I know the stress-free time that last week had nothing to do with it. We’re missing you two, so we’re having the tile replaced. Not much of a substitue, but at least it keeps more people around to fill the void!